There’s an abundance of hard things in the world around us. People we know and love are struggling or suffering in one way or another. Then there are our own personal trials we must work through. There’s the hard of a job loss and limited income. There’s the hard of a family member getting a cancer diagnosis. There’s the hard of infertility, a wayward child, a physical limitation, or an unexpected tragedy. I remember the hard of carrying a baby in my womb – a baby that kicked and moved A LOT – and knowing that she’d never live to grow up. There was the hard of random cashiers asking when you were due, not knowing what that date would bring for you. That was my hard in one season of life. But what about a mom who’s lost her teenager in a car accident? How about the wife whose husband of 56 years just passed away? We all have hard, and there’s no point comparing. ‘Cause just like you can’t measure hard, you can’t measure grace. Whatever’s hard for you and I today, God has the grace to get us through it. We don’t have to handle hard on our own. He tells us in 2 Corinthians 12:9 that His grace is sufficient. Sufficient means enough to fully meet the need. Isn’t that amazing? His grace isn’t going to fall short. My situation’s not going to be the one where there’s just not quite enough grace to cover it. A lack of heaven-sent grace to keep me going is not a problem I have to worry about. He will provide the grace I need today, tomorrow, and for every day in the future. That verse also tells us that His strength is made perfect in weakness. Relying on our own strength when we face difficulty is often our default method. But, if you’re like me, you know that doesn’t get us very far. Instead, we can choose to admit our weakness, our lack of ability to handle the situation, and allow God to supply us with His strength. What a trade – my weakness for His strength!! So whatever’s hard for you today, take it to God. Know that His grace is there for you. Admit your weakness. Lean into His strength. Let Him be glorified, whatever the outcome. And give Him thanks for His always sufficient, immeasurable grace. Thank you for this Tracey. I am very guilty sometimes of being so overwhelmed by my own “hard” that I fail to see what others around me are going thru. I needed this reminder. And I, too, pray every day that the Lord’s strength will be perfected in my weakness. Thank you so much for your prayers!! I, too, focus too often only on my own problems, while missing opportunities to minister to others who are hurting. Think of you and pray for you as well!! Oh, yes! It’s so easy to compare my “hard” with someone else’s and think that it’s really pretty easy for them. But everyone has their own hard things they have to deal with, and as you say, there’s really no comparing. Oh, wow! 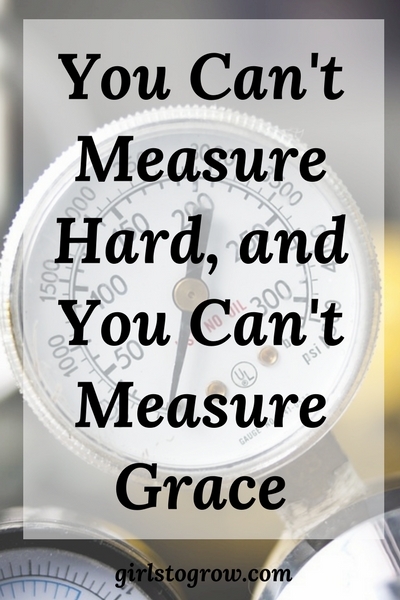 I’ve honestly never thought about the fact that you can’t compare measures of grace – that through God they’re all sufficient for everything we go through each day. They’re literally uncomparable.